In an effort to continue growing the resources provided to students by the Homelessness and Food Insecurity Taskforce [HFI] this November, Emergency Housing and Shower Services have become official resources RU students can take advantage of. This resource is for any enrolled Roosevelt University student who is experiencing a crisis and needs a temporary place to stay overnight. Students experiencing homelessness or home insecurity that are interested in staying in Emergency Housing, should go to the Office of Residence Life, located on the 14th floor of the Wabash Building (During business hours, M-F 9-5pm), or a campus safety desk between the hours of 5 – 11pm. Once there, the student should share that they are looking to check-in to Emergency Housing.  Emergency Housing is a resource offered at no cost to the currently enrolled RU students.  The number of nights a student can stay in Emergency Housing is determined by the situation of the student and availability of space.  Anyone staying in Emergency Housing will be asked to complete an “Action Plan”. Housing insecurity impacts people in many ways. 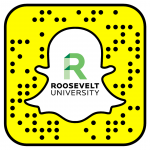 This resource is for any enrolled Roosevelt University student who is experiencing a crisis and may need access to shower services. Visit the Office of Residence Life on the 14th floor of the Wabash Building. Shower Service available Mon – Fri 9am – 11pm. Student ID required at check-in. Towels and toiletries can be provided, however you are encouraged to bring your own supplies if available.